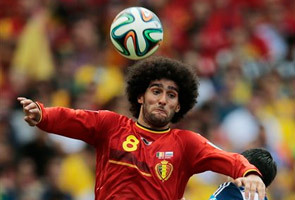 RIO DE JANEIRO: The Maracana pitch is very energy-sapping and, given warm conditions, was tough for Belgium and Russia in Sunday's World Cup encounter, Belgian midfielder Marouane Fellaini said. Both Fabio Capello, the Russia coach, and Belgian counterpart Mard Wilmots said the match had been "very intense" and Fellaini said the dry conditions had made life difficult. "The pitch was very dry. It was physically hard out there for both teams and we also had to deal with the warm conditions," said Fellaini, who scored from the bench against Algeria in the opening group game. Fellaini, who was a hit with Everton prior to a difficult just-ended season with Manchester United, told AFP he believed it was too early to compare the current Belgian side with the 1986 vintage which reached the semi-finals. "You know you can't really compare across the decades. But we know we have a good team and strength in depth. "We have to continue what we have been doing," the 26-year-old former Standard Liege favourite said. Fellow midfielder Axel Witsel also highlighted the dry playing surface. "It was a very dry pitch. This is turning out to be a great World Cup. "Today, we came through -- but we mustn't get carried away."